B.F. Avery & Minneapolis-Moline Avery. detailed photos, illustrations and exploded views. can see immediately how it all goes back together. with the tractor. The manual that was given to the ultimate consumer by the manufacturer. installed. They are cleaned and tested for cracks. 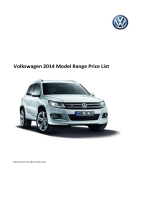 * Price per cylinder head. Engine may require 2 or 3 cylinder heads. and White tractors and combines. 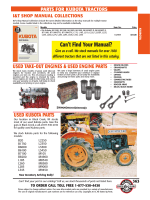 1850 & 1950 diesel w/Perkins 6-354 engine 31322302 200613 $600.00 Mfg. вЂў Rod Bearings are sold as individual bearings unless otherwise noted. вЂў Main Bearings are sold in complete sets unless otherwise noted. вЂў Oversized bearings are listed for slightly worn crankshafts that have been ground. MANY OTHER BEARINGS ARE AVAILABLE. CALL FOR APPLICATIONS & PRICING. 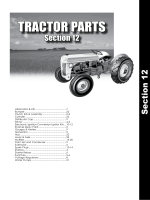 $17.00 CanвЂ™t find your part in our catalog? 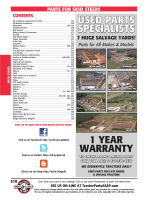 Call us, we stock thousands of parts not listed here. overhaul. Valve seals not included. cylinder head. Valve seals not included. вЂў Conversion sets include all gaskets not included in the head gasket set. call for applications & pricing. 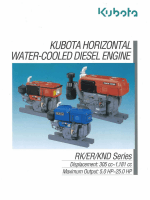 carry many remanufactured water pumps that are not listed. that are not listed below. вЂў 2-7/16вЂќ I.D., 3-3/4вЂќ O.D. New carburetors are ZenithвЂ™s designed to replace the original MarvelSchebler. Please confirm your carburetor number before ordering. Please confirm your carburetor number before ordering. carburetor rebuild. Floats sold separately. CALL US TODAY FOR REBUILT PARTS! needed for a thorough rebuilt unit. Item No. Price Item No. Price Item No. Price Item No. Price Volts Item No. For all Pertronix electronic ignition systems. 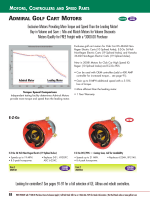 Volts Ground Brand Distributor No. * Rotor not included in the kit. Item No. Price Item No. Heat Range Brand Item No. Volts Teeth Rotation ManufacturerвЂ™s No. AVAILABLE AS USED OR NEW! steel & assembled to exact specifications. TIE RODS & OTHER FRONT END PARTS! warranty subject to pump inspection. вЂў 7.00вЂќ O.D x 1.000вЂќ I.D. Top Link w/ plenty of adjustment. Heavy duty balltype sockets. Adjustment for various lifting heights. nuts for positive adjustment hold. w/ plenty of adjustment. Heavy duty ball-type sockets. included. Item ships via freight carrier. bearing and new release bearing unless otherwise noted. Size Hub Spline Center Type Size Levers Springs Type Item No. s/n 191514-later), 1750 diesel (s/n 6 Lg. combines. Every transmission we sell comes with a one-year warrany! demands of industry and agriculture. Use a hardener or a lacquer. It is not necessary to use both on any job. Hardener takes 1/2 to 1 pint per gallon of tractor paint. have salvaged over the past 10 years. See Page 466 For our Complete Selection of Rims. вЂўSturdy metal parts specially treated to stand up to the severest weather conditions.